Zuckerberg chuckled as he uttered these words to kick off F8 2018 – a self-deprecating acknowledgement of the fire Facebook has come under in the wake of the massive Cambridge Analytica data scandal, one that saw Zuckerberg testify before Congress and a wave of Facebook policy changes arise in its wake. Misuse turned out to be a common theme at this year’s F8. Facebook’s stance seems to be that its platform is fundamentally good, but there are bad actors out there who want to exploit its users. Facebook has had a number of high-profile scandals rock user trust in the platform in recent months, including revelations of Russian interference in the 2016 US presidential election and Cambridge Analytica improperly obtaining the data of up to 87 million Facebook users. Cambridge Analytica, which worked for President Donald Trump’s campaign during the election, announced on Wednesday that it’s shutting down. The sobering reality for Facebook is that it’s more powerful than ever in terms of the number of people who use its platform and the influence, both good and bad, that it yields. The challenge Facebook faced at the conference and one it will continue to face going forward is how to thread together its optimism about connecting people with the reality that people have figured out how to use its platform for their own gains. During a separate talk on security at Facebook, Alex Stamos, the company’s chief security officer, acknowledged that there can be instances of people using Facebook products in a technically correct manner, yet with the aim to carry out ill will. Facebook has woken up to this fact, and has taken a number of steps to address its security and privacy flaws, including restricting the data that developers have access to and giving users an easier way to control their privacy settings. One new tool in the works that Facebook announced at F8 is a Clear History feature that will let users wipe their browsing history from Facebook. When it rolls out in a few months, you’ll be able to see what websites and apps send your browsing history to the social network. You’ll then be able to clear this information from your account and make sure no such data is stored in connection with your account in the future. Still, something like Clear History is a widely requested feature, and one that’s likely to get plenty of use. Facebook didn’t shy away from addressing the many elephants in the room at this year’s F8, it’s biggest conference of the year. It took some of the blame, particularly in terms of not acting more quickly in certain instances and in failing to anticipate how its platform could be used by nefarious actors. 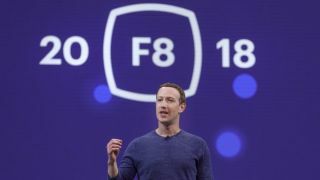 This was, in some ways, a more grown-up version of Facebook than we’re used to seeing at F8, a conference that has in the past been more of a celebration, with ample time spent talking about internet drones and selfie sticks in VR. The enthusiasm was no doubt still there, but there was also an acknowledgement of the responsibility Facebook has to its users and society at large, one it can’t afford to ignore. What’s more, there was the acknowledgement that mistakes will happen again. Can Facebook balance the optimism it effuses about connecting people with the reality that it’s in a security “arms race” (Zuckerberg’s words) with “adversaries” (again, his word) who challenge the platform every day? Whether Facebook wants to or not, the reality is, it has to.